Studies of quasars and active galactic nuclei (AGN) in our (by comparison) nearby universe show that they can be prolific producers of ionizing photons. However, the luminosity function of these sources peaks at around z = 2, which means they might not have been abundant enough at high redshift to produce the necessary amount of reionizing photons. Intensely star forming galaxies (at high redshift) might be prolific producers of these shorter wavelength photons, called Lyman Continuum (LyC) emission. In their paper submitted to the Astrophysical Journal, Vanzella et al. look for galaxies rich with ionizing photons at a moderate redshift of z = 3 -4, in the hopes that they are analogs of galaxies at higher redshift. Ideally, it would be best to observe these objects in their local environment (at z = 7), but severe IGM absorption due to neutral hydrogen makes these kinds of observations extremely difficult. 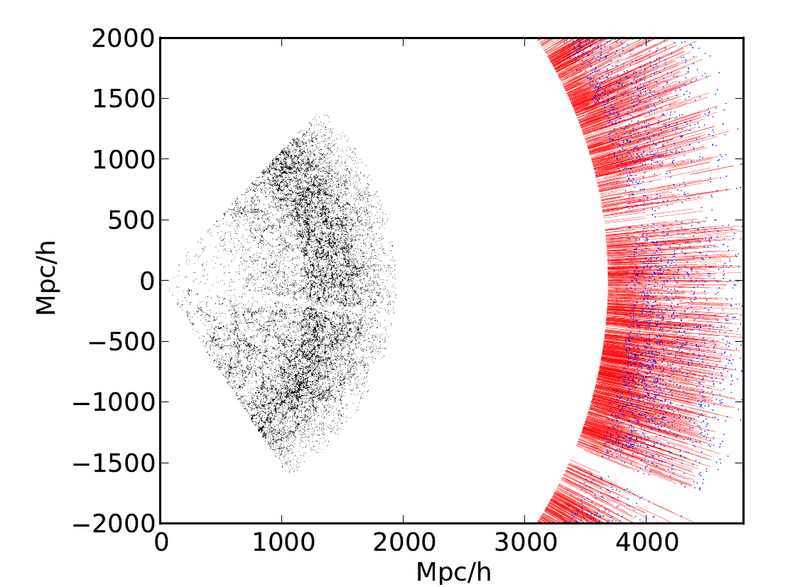 The authors study a sample of 122 B-band dropouts galaxies from redshift 3.4 to 4.5 (selected via the Lyman break technique and confirmed via spectroscopy, thus they are called “Lyman Break Galaxies” (LBGs)) in the GOODS-S field, which is deeply imaged by the Hubble Space Telescope. The authors then search for sources of LyC emission. However, this whole analysis is made difficult by the fact that at these redshifts, any of these LyC spots are too faint to observe with a spectrograph, since spectroscopy (such as of a bright, nearby supernova) requires more observing time than imaging, and thus is economically limited to brighter objects. At redshifts of 3 to 4, the 912 ang Lyman limit is completely shifted redward of the passband of the U photometric filter. From this starting sample of 122 LBGs, the authors then narrow it down to 32 galaxies which have significant flux detections in the U band image, which means the flux would have to be LyC flux. Of these 32, the authors only consider those in which the U band flux is spatially offset relative to the centroid of the longer-wavelength images, because they are looking for galaxies where the Lyman Continuum emitting region is able to produce photons that would escape the galaxy, since dust and gas within the galaxy itself would absorb these photons before they had a chance to reionize the intergalactic medium. Then, the authors throw out 9 more galaxies from this sample because the U band flux could be unambiguously explained as coming from the outer regions of (contaminating) nearby sources. Now with this final sample of 19 galaxies, the authors scrutinize them to determine the properties of Lymam Continuum emitters. The punchline: unfortunately, of the remaining 19 candidate Lyman Continuum emitters, the authors find that all but one of them could be attributed to “foreground interlopers,” intervening galaxies at lower redshifts that just happen to be projected nearby on the sky. How did the authors rule these candidates out? Although spectroscopy was possible for the LBGs themselves, it is generally not possible for the faint LyC emitting region that is presumed to be associated with the LBG. Therefore, the authors found photometric redshifts for these regions. Because they found that most of the candidate LyC regions are at a significantly lower redshift than the previously associated Lyman break galaxy, they conclude that they must be “foreground interlopers.” Because these interlopers are at lower redshift, their flux is not redshifted as much, and thus they appear bluer. Nonetheless, one of the remaining candidates is indentified as a viable Lyman Continuum emitter. From the color, coincident photometric redshift, and compact shape, the authors conclude that it is likely a star forming galaxy, and a “Lyman Continuum” emitter. Only when all this evidence was in hand did they attempt to get a spectrum (at high cost, compared to imaging), which unfortunately did not reveal many features. They suggest that this LyC emitter has a high escape fraction of ionizing photons, meaning that these photons would simply escape the galaxy and ionize the intergalactic medium, instead of interacting with local material and driving nebular recombination lines such as Lyman alpha, oxygen, or the hydrogen Balmer transitions. Although it may seem obvious, the authors stress the importance of measuring the non-Lyman continuum radiation (ie, the flux of the galaxy at 1500 angstroms) and the strength of the Lyman Continuum emission in the same spatial region when calculating escape fractions. Ensuring that two different kinds of emission come from the same region at high redshift is non-trivial, however, as the authors demonstrated by the attrition of their initial sample size. In conclusion, studying the sources that reionized the intergalactic medium is difficult given our current instruments. While such observations are near-impractical at z =7, careful studies of these sources at moderate redshifts can shed light on the nature of higher redshift sources. From Vanzella et al. 2012. A) Spectral energy distribution (SED) for the Ion1 galaxy, a candidate Lyman Continuum emitter. B) Keck/DEIMOS spectrum yielding a redshift of 3.79. C) X-ray, optical and infrared images of the galaxy.